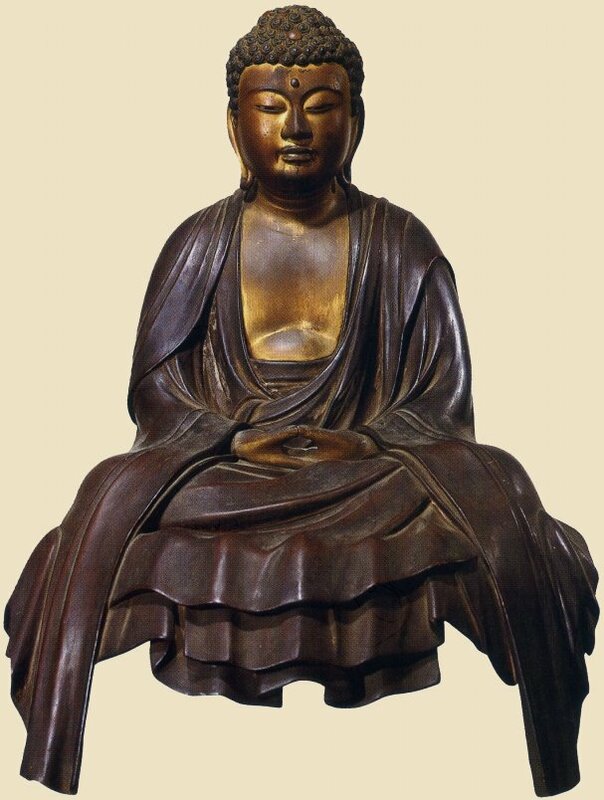 Japanese Busshi (Sculptors), Muromachi Period, Who Made Japan's Buddha Statues? 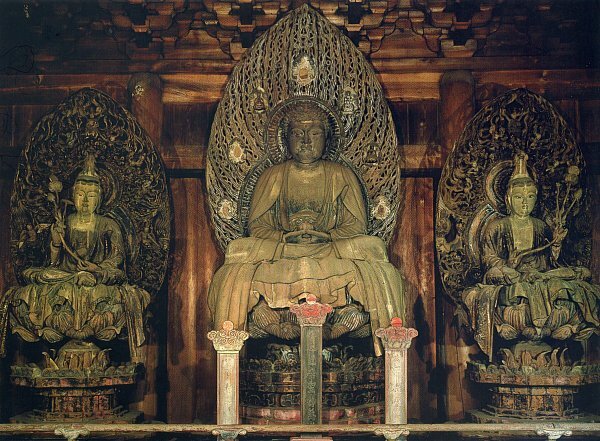 Who Made Japan’s Buddha Statues? Before starting, please see the Busshi Index. It provides an overview of Japan’s main sculptors (Busshi) and sculpting styles, a helpful A-to-Z Busshi Index, plus definitions for essential terms and concepts. This section of our site includes 14 pages, covers 100+ sculptors, features 100+ photos, and provides the web’s first-ever integrated guidebook to Japan’s sculptors. 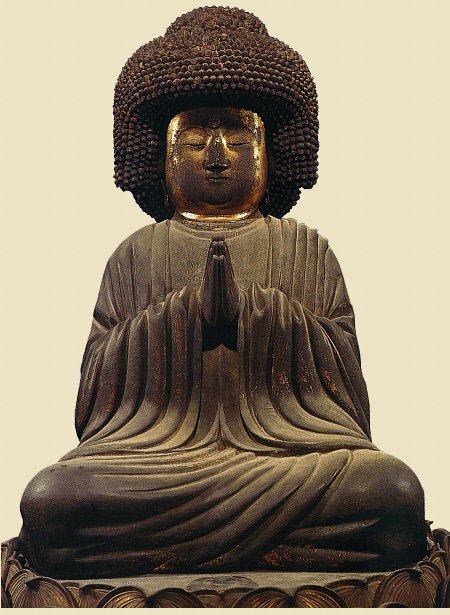 The new and reformed Buddhist sects of the prior Kamakura period consolidated their gains, and Buddhism for the commoner thereafter remained a regular feature of Japan’s religious landscape. Pilgrimages to sacred sites devoted to Kannon Bosatsu, to the Ise Shinto shrines, and to the top of Mt. Fuji also became popular. Yoshimitsu 足利義満 (+1358-1408), the third Ashikaga Shōgun, ushered in a brief period of cultural renaissance, highlighted by the reopening of formal trade with China after a lapse of nearly 600 years, the building of great temples and palaces (e.g., the famous Kinkakuji 金閣寺 or Golden Pavilion in Kyoto), and strong patronage of the arts and Zen Buddhism. Nevertheless, the period was marked by incessant civil wars. Fighting lasted until the arrival of the “great unifer,” the feudal warlord Oda Nobunaga 織田信長 (+1534-1582), who marched into Kyoto in +1568 and captured the city. Oda needed a few more years to overthrown the Muromachi Bakufu 幕府, which he achieved with the abdication of the last Ashikaga Shōgun (Shogun) 足利将軍 in +1573. Even so, many of Kyoto’s great art treasures were lost during the fighting, and the powerful Buddhist monestaries suffered greatly soon thereafter. The Tendai 天台 stronghold at Enrｙakuji Temple 延暦寺 on Mt. Hiei 比叡 was burnt to the ground in +1571 by Oda and its militant monks scattered. So too was the powerful Ishiyama Honganji Temple 石山本願寺 of the Jōdo Shinshu 浄土真宗 (True Pure Land) sect in Osaka, set to flame by Oda in +1580. The considerable political power of the entrenched Buddhist monasteries never recovered from this onslaught. They were no longer allowed large landholdings, lost various other economic advantages, and found their connections with the now-powerless imperial court of little value. Unlike the Tendai and Pure Land sects, the Zen denomination rose to prominence and political power during the Muromachi period, with many warriors turning to Zen Buddhism for release. Another major feature of the age was Ikkō-ikki (一向一揆), literally "single-minded leagues." Ikki means “revolt.” The Ikkō-ikki were mobs of peasant farmers, monks, Shinto priests and local nobles, who rose up against samurai rule in the 15th and 16th centuries. They followed the beliefs of the Jōdo Shinshu (True Pure Land) sect of Buddhism which taught that anyone, noble or peasant, man or woman, could be saved by Amida Buddha's grace. They were organized to only a small degree. In the end, Oda Nobunaga was betrayed by one of his generals (Akechi Mitsuhide 明智光秀 +1528-1582) and forced to commit ritual suicide in +1582. But the traitor was soon overthrown by Toyotomi Hideyoshi 豊臣秀吉 (+1536-1598), a loyal Oda ally, who then proceeded to eliminate rivals and succeeded in unifying Japan around +1590. In his efforts to gain control, Hideyoshi issued an edict in +1587 banning Christianity, although this edict was not enforced initally (e.g., Christian missionaries were still allowed to enter Japan in +1593). But in +1597, Hideyoshi had 26 Franciscans executed, and laws prohibiting the foreign religion continued unbated into the 1630s. After Hideyoshi’s death, another loyal Oda ally named Tokugawa Ieyasu 徳川家康 (+1542-1616) assumed control. In +1603, he founded the Tokugawa Shogunate 徳川将軍, which ruled Japan for the next 250 years from Edo 江戸 (modern-day Tokyo). Dark age of statue making. Why did statuary spiral downward? Rise to prominence of Zen Buddhism, which focused on painting, calligraphy, the tea ceremony, and literature. Zen’s main devotional deity is Shaka Nyorai, the Historical Buddha, with little concern for the many other Mahayana deities. Declining power of the imperial family, and thus a drop in its patronage of Buddhist art and architecture. Incessant warfare among the nobility lessens Buddhist patronage among the great feudal clans. Techiques for the systematic mass-production of Buddhist statuary are perfected, formalized, and endlessly copied. Nikkō Bosatsu (holding red disc) & Gakkō Bosatsu. Important Cultural Properties of Zushi City, Japan. Dated: Muromachi Period, 15th-16th Century, Wood. Jinmuji Temple 神武寺 (Tendai Sect) in Zushi City. Yosegi Zukuri 寄木造 (Joined-Block Technique). Height: 58.0 cm and 59.5 cm. 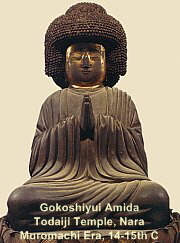 Gokō Shiyui Amida 五刧思惟阿弥陀 (aka Hōzō Bosatsu). Tōdaiji Temple (Nara), H = 106.6 cm, Muromachi Era. Hōzō practiced for an inconceivably long time (five kapla = 五刧 = Gokō), and is thus shown here with thick hair. Wood, H = 95.6 cm. Yakushi Nyorai & 12 Generals at base. Tōji Temple 東寺 in Kyoto, Wood. Dated 1603. By Kōshō 康正 (1534-1621). Unchō 運朝 and Chōkei 朝慶 reportedly gained Hōgen 法眼 rank (the second highest rank awarded to Buddhist sculptors in those days). 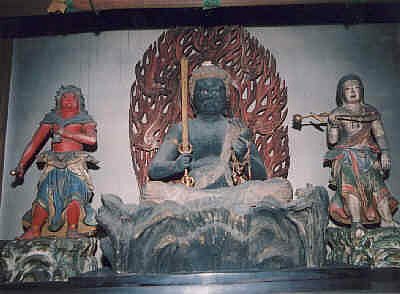 They are credited with a statue of Fudō Myō-ō (dated 1351) installed at Chōanji (Choanji) Temple 長安寺 (Kurihama, Kanagawa Pref. ), just south of Kamakura. See photo below. Gengorō (Gengoro) 源五朗. Member of the Shukuin Sculpting Guild in Nara. Birth-death dates unknown. Genji 源次. Second-generation member of the Shukuin Sculpting Guild in Nara. 16th century. Genshirō (Genshiro) 源四郎. First-generation member of the Shukuin Sculpting Guild in Nara. 16th century. Genzaburō (Genzaburo) 源三郎. Third-generation member of the Shukuin Sculpting Guild in Nara. 16th century. Kankei 覚慶. Member of the 14th-century Tsubai Guild. Extant statues include Kisshōten (1340) at Kōfukuji Temple in Nara. Keishū (Keishu) 慶秀. Member of the 14th-century Tsubai Guild. 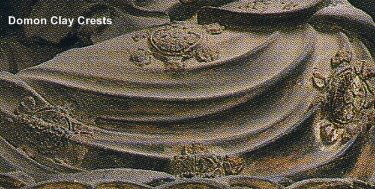 Keishū 慶秀 reportedly helped restore the 11-Headed Kannon 十一面観音 at Kasuga Jingūji 春日神宮寺 (1368). Ken'en 憲円, also known as Sanjō Hōin Ken'en 三条法印憲円 (birth/death unknown; Kyoto Guild). Famous Kyoto-based sculptor of the 14th century. Extant wood statue of Jizō Bosatsu at Hōkaiji (Hokaiji) Temple 宝戒寺 in Kamakura, dated to 1365, and designated an Important Cultural Property. The statue is the first on the Kamakura Piligrimage to 24 Jizo Sites. See above photo of Kosodate Kyōyomi Jizō. Kōson (Koson) 弘尊. Takama Guild. Most celebrated sculptor of this workshop (15th century). He worked with Tsubai sculptor Shunkei 春慶 on the restoration of the 11-Headed Kannon 十一面観音立像 at Hasedera 長谷寺 in Nara. Takuma Jōkō (Takuma Joko) 宅間浄宏. A respected sculptor of the 14th century based in Kamakura. Extant pieces include a Jizō statue now installed at Raikōji Temple, Kamakura. See Jizō photos directly below. Takuma hailed from a family of sculptors and painters that lived and worked in the Kamakura area. It is sometimes referred to as the Takuma Bussho 宅間派 (Takuma Workshop, Takuma Guild). During his lifetime, Takuma Jōkō gained Hōgen (Hogen) 法眼 rank, the second highest rank awarded to Buddhist sculptors. Ganjō Jizō 巖上地蔵. Lit. = Jizō Sitting Atop Rock. Important Cultural Property of Kanagawa Prefecture. prominence in Kamakura and the surrounding Kanto region in the late-Kamakura era and Nanbokuchō Period. Shaka Nyorai (Historical Buddha) at Hōkokuji (Hokokuji) Temple 報国時 in Kamakura. Wood, H = 50.6 cm. Central image of worship at this temple. Nanbokuchō Period 南北朝時代 +1336-1392. to great prominence in Kamakura and the Kanto region in the late-Kamakura era and Nanbokuchō Period. Yakushi Triad (Yakushi Sanzon 薬師三尊) at Kakuonji Temple, Kamakura. ICA. Nikkō Bosatsu on left (to your right) and Gakkō Bosatsu on right (to your left). Nikkō (Sunlight) and Gakkō (Moonlight) statues attributed to sculptor Chōyū. Dated to 1422. H = 149.4 cm. Inscription found in head of Nikkō statue says it was carved in 1422 by local sculptor Chōyū. Central Yakushi image: H = 181.2 cm. Head dated to Kamakura Period and body to Muromachi Period. 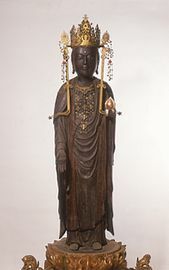 The original central statue (attributed to Unkei) was destroyed in a fire in 1251 and remade in 1263.
the facial features, and the slender fingers clearly reflect the influence of China’s Sung period (Sōdai 宋代). These features also suggest that the Kamakura Busshi wanted to be independent from Kyoto culture or to rival it. Central image of Fudō Myō-ō attributed to Unchō 運朝 and Chōkei 朝慶. Fudō Myō-ō. Dated 1351. Hinoki (cypress), made from one piece of wood. H = 65.6 cm, crystal eyes. This section is indebted to the JAANUS database compiled by Dr. Mary Neighbour Parent (deceased). Like all prior periods in Japanese history, the Muromachi period gave rise to a number of sculpting guilds and workshops (Jp. = Bussho 仏所), also known as sculpting schools (Jp. = Ha 派). Nanto Busshi 南都仏師. 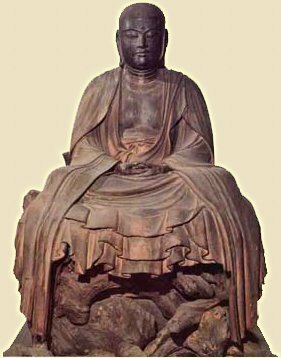 Literally “Busshi of the South.” A general term for Buddhist sculptors working in Nara during and after the Kamakura period (13th to 14th centuries). Nara is considered the southern capital, Kyoto the nothern capital, but by this time political power was held by the military government much further north in Kamakura and the Kanto region. Several schools of Nanto Busshi were particularly important in the Muromachi period. 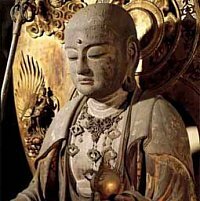 The origins of the Nanto Busshi goes back to the time of Kakujo 覚助 (d. 1077), the son and successor of famed sculptor Jōchō (d. 1057). See Nanto Busshi Glossary for details. From their loins sprang the celebrated Nanto Busshi of the Keiha School 慶派 of sculptors, based originally at Kōfukuji Temple 興福寺 in Nara. Their most renowned artists were Unkei 運慶 (d. 1223) and Kaikei 快慶 (d. 1226). An innovative branch of the Keiha School known as the Zenpa School 善派 (closely associated with Saidaiji Temple 西大寺 in Nara) also emerged in the Kamakura period (13th century). This was followed by the emergence of the Nanto Busshi schools known as Tsubai Bussho 椿井仏所 in the 14th century, and then the Takama Bussho 高間仏所 and Shukuin Bussho 宿院仏師. The latter two were most active in the 15th and 16th centuries. Other schools set up in the mid-to-late 14th centuries include the Nobori-Ōji Bussho 登大路仏所 and Fujiyama Bussho 富士山仏所. Most of these schools / workshops survived into the Edo Period (1615-1868). For more details, see JAANUS Entry 1 and JAANUS Entry 2. Shukuin Busshi 宿院仏師 and Shukuin Bussho 宿院仏所. Sculptors based in the Nara area. Came to prominence in the 16th century and prospered for some 80 years. Main workshop was called Shukuin Bussho 宿院仏所 (aka Shukuin Bussho-ya 宿院仏所屋), for they came from a location in Nara known as Shukuin 宿院. They were originally carpenters (Jp. = Tōryō 棟梁, Toryo) and wood craftsmen (Kiyose Banshō 木寄番匠). Shukuin was one of the first Bussho (workshops) where sculptors worked as laypeople without assuming the status of monks or without joining the monastic orders. See above list of Shukuin sculptors. Many of their artisans made wooden statues, often commissioned by small temples in the Nara area (e.g., Shaka 釈迦 and Yakushi 薬師 figures at Higashida Yakushidō 東田薬師堂). Other similar commercial workshops were active in the Edo Period (1615-1868), and the bussho system itself survived until the 19th century. 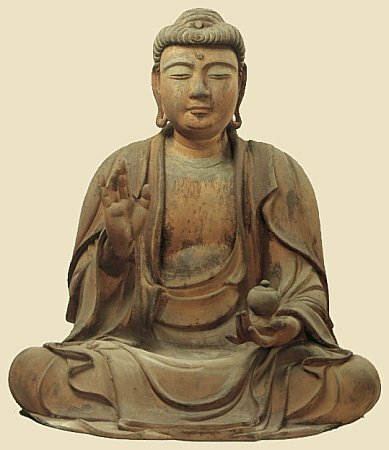 The bussho model is credited to Jōchō (d. 1057). For more details, see this J-site. Nyoirin Kannon 如意輪観音像, Raikōji (Raikoji) Temple 来迎寺 (Kamakura City). Wood with domon crests (see photo below). Dated to Nanbokuchō Period 南北朝時代. The Nyoirin Kannon 如意輪観音 statue at Raikōji Temple in Kamakura features a beautiful domon 土紋, or clay crest. 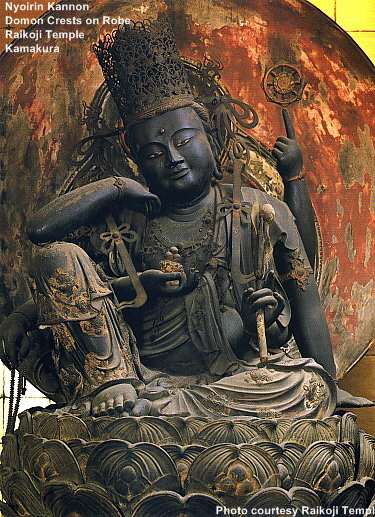 The domon technique was used for decorating Buddhist statues and is unique to Kamakura, and is thus also known as Kamakura Domon 鎌倉土紋. Clay is kneaded 練 (neru) into patterns or placed in molds and then affixed to the statue with lacquer, resembling a relief. The crests on this statue are said to ward off evil (厄除け yakuyoke) and to ensure easy delivery (安産 anzan) to women in labor. Statue dated to 14th century. Also Ashikaga jidai 足利時代. The Muromachi period, 1392-1568. The period derives its name from a district in Kyoto which served as the location for the unification of the Southern and Northern Courts in 1392 under the Ashikaga 足利 shogunate (see *Nanbokuchou jidai 南北朝時代) until the entrance of Oda Nobunaga 織田信長 (1534-82) into the capital in 1568. Occasionally sources give 1333 as a beginning date, thus including the Nanbokuch・era within the period. The Ashikaga palace at Muromachi was actually completed in 1378, but no sources begin the period with this date. Many scholars put the final year at 1572 (or 1573) when the last Ashikaga shougun 足利将軍, Ashikaga Yoshiaki 足利義昭, was deposed by Nobunaga. Alternately, some political historians treat the Muromachi period as lasting only until the start of the Ounin Wars, Ounin-no-ran 応仁の乱 in 1467, after which it becomes the *Sengoku jidai 戦国時代 (Warring States period). The period is especially notable for ink painting *suibokuga 水墨画. JAANUS http://www.aisf.or.jp/~jaanus/deta/n/nanbokuchoujidai.htm. The Southern and Northern Court period (1336-92). It takes its name from two separate antagonistic Imperial courts supported by their respective military clans which fought to establish their right to sole legitimate rule. While the Northern Court was still in Kyoto, the Southern Court was established at *Yoshino 吉野, south of Kyoto (modern Nara, therefore the period is also called *Yoshino jidai 吉野時代). Perhaps in response to the almost continual wars throughout the country, particularly in the capital, many warriors turned to Zen 禅 Buddhism which was introduced from China at this time, resulting in significant advances in Zen-related arts (see *suibokuga 水墨画). Some sources place the beginning of the period at 1333, when the Houjou 北条 regents were destroyed, rather than at 1336, when Emperor Godaigo 後醍醐 (1288-1339) first established his court at Yoshino. The two imperial lines were rejoined in 1392. JAANUS http://www.aisf.or.jp/~jaanus/deta/s/sengokujidai.htm. Lit. The period began with the outbreak of the Onin Wars (Ounin no ran 応仁の乱, 1467-1477) and lasted up to the entrance of the great unifier Oda Nobunaga 織田信長 (1534-1582) into Kyoto in 1568. The term is used to refer to the Late Muromachi period (*Muromachi jidai 室町時代 kouki 後期), when many areas of the country were locked in civil war. One source also suggests 1491 as a beginning for the period, that being the year in which Houjou Souun 北条早雲 (1432-1519) destroyed the Horikoshi 堀越. Others include with it the subsequent Momoyama period (*Momoyama jidai 桃山時代; 1568-1615). The period of 100 years (1467-1568) devastated the city of Kyoto destroying countless numbers of art treasures during the fighting. The term "Warring States" was adopted from the Chinese Zhanguo 戦国 period (ca 403-221 BC). the most memorable artistic trend of the period is the early Kano style developed by Kanou Masanobu 狩野正信 (1434-1530) and Kanou Motonobu 狩野元信 (1476-1559). Motonobu's greatest surviving work is at Reiun'in 霊雲院 built in 1543 in Myoushinji 妙心寺. Kanou artists decorated large screens (*byoubu 屏風) and sliding door panels (*shouhekiga 障壁画) in Shogunal residences and temples, many of which were destroyed in the century long skirmishes mentioned above. JAANUS. Japanese Architecture & Art Net Users System. Online database devoted to Japanese art history. 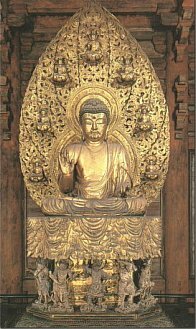 Compiled by the late Dr. Mary Neighbour Parent, it covers both Buddhist and Shintō deities in great detail and contains over 8,000 entries. Dr. Gabi Greve. See her page on Japanese Busshi. Gabi-san did most of the research and writing for the Edo Period through the Modern era. She is a regular site contributor, and maintains numerous informative web sites on topics from Haiku to Daruma. Also see this Gabi page on Muromachi era. Many thanks Gabi-san !!!! Heibonsha, Sculpture of the Kamakura Period. By Hisashi Mori, from the Heibonsha Survey of Japanese Art. 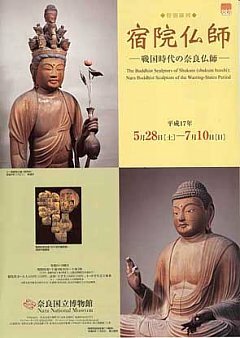 Published jointly by Heibonsha (Tokyo) & John Weatherhill Inc. A book close to my heart, this publication devotes much time to the artists who created the sculptural treasures of the Kamakura era, including Unkei, Tankei, Kokei, Kaikei, and many more. Highly recommended. 1st Edition 1974. ISBN 0-8348-1017-4. Buy at Amazon . Japanese only. Searchable database provided by The Agency for Cultural Affairs. Search by era, artist, prefecture, etc. Japanese only. Numerous pieces from the Muromachi era. Numerous Japanese-language temple and museum catalogs, magazines, books, and web sites. See Japanese Bibliography for extended list. Bunkaken.net. Busshi & Deity Reviews. Also see lineage chart. Site by M. Katada with Keiha lineage chart. Japan’s National Treasures and Busshi Data. Inpa, Enpa, and Keiha Lineage Charts. Kyoto Busshi by Period from Encyclopedia of Kyoto. Hidden Buddha, Walking Around Kyoto Monthly Magazine. Important Busshi and Lineage Chart. Copyright 1995 - 2012. Mark Schumacher. Email Mark.